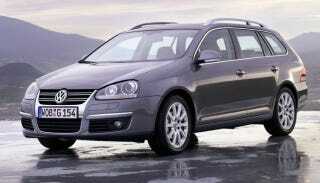 Say hello to the Jetta wagon it took Volkswagen two years longer than its sedan variant to introduce. But cut V-dub some slack; it just wanted to get everything right so you'll like them again. It's being unveiled as the Golf Estate in the land of Europe next week at the Geneva show. It'll come with a choice of four engines, including the Twincharger TFSI that sports both supercharger and turbo, and two diesels producing 105 hp and 140 hp, respectively. No word on US release, but expect a launch in New York, according to those who say they know.